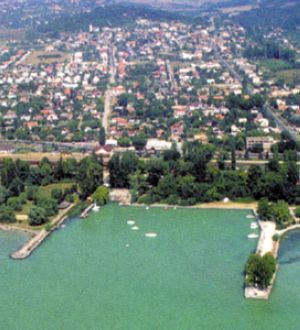 An almost homogeneous resort area is created by the vineyards between the small villages from Almádi to Füred. The old village of Alsóörs of 1,300 inhabitants is located at the foot of Somlyó hill. The resort place was built southwards from here, down to the lake-shore, with a huge, fine-water beach. Alsóörs is an ancient village, first mentioned in records in 1272. Originally it had been the property of royal Lord High Stewards and later one of the queens. Its inhabitants escaped from the Turks and the village was repopulated only in the first half of the 18th century. Resort life started at the beginning of the 1990s. 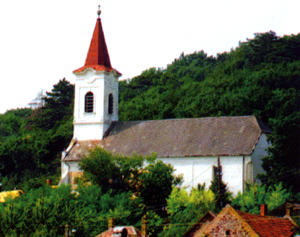 Calvinist church of the age of the Árpáds at the southern foot of Somlyó hill, with an organ-loft for patrons from the 13th century under its tower. The church was rebuilt, the fresco of Byzantian style was restored. The oldest manor-house of Hungary (from the 15th century) close to the church, in Petőfi street; it is called Turkish House because of its chimney of turban form. The building has been renovated nicely, currently it is the exhibition hall of the village. The construction of a Leisure Centre has been started by the recultivation of the red stone mine. In the year of the Millennium the Saint Stephen monument by Erika Ligeti was unveiled in the park of the Community Centre. The settlement is proud of its beach, which is growing nicer and larger year by year. In 2004 it was awarded the Blue Wave Flag. 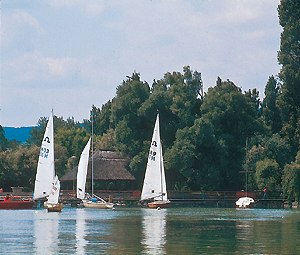 The beautiful camping site on the lake shore, which is owned and run by the local council, was opened in 2005. Parking is free in the car park in front of the beach. The village centre has been finished, too. There is a new health and trade centre there. Programmes of Alsóörs Summer are the exhibitions organized in the Turkish House and the Summer Farewell Programme prior to St. Stephen's day with introducing local wines as well as music programs. The Cser hill look-out tower was restored by the local council and the Foundation for the Restoration of the Look-out Tower in 2003. The look-out tower (295-metre high) is of one-hour walk from the village (blue route sign). A popular place of excursion of the country is the spring in Királykúti valley. 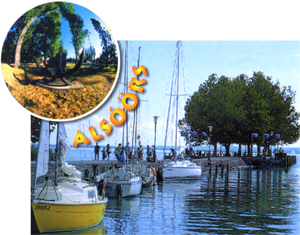 Via Malom valley and the village of Lovas (green route sign) we can get to Felsőörs where one of the most beautiful Roman-age churches of the Balaton highlands can be visited.